They’re nutritious but not so delicious. So I’m sure you’ve wondered, what to put in oatmeal to make it taste better? 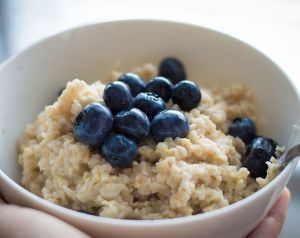 Oatmeal is one of the healthiest breakfast foods around. It is filling and gives us the energy needed to start the day. More importantly it is loaded with fiber, protein and iron. Plus, it has no cholesterol. 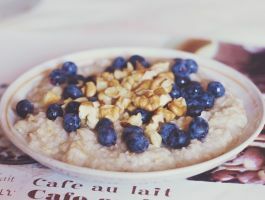 Yet, because it doesn’t taste as good as commercial produced cereals, it isn’t as popular a breakfast food as the latter, despite being much healthier. This is why we’ve looked into the different toppings, ingredients and add-ins you can incorporate into your bowl of oatmeal to make it delicious. If you find your oatmeal a bit dry or needing added smoothness, try milk. You get a fill of calcium, vitamin D and protein. Plus it changes the texture and taste of your breakfast bowl completely. You can go with regular cow’s milk whether skim, 1% or whole fat depending on your diet and what kind of flavor you think works best. If you’re not a fan of regular milk, try almond, soy or rice milk. These are non-dairy milk options that come with similar nutrients as milk. Looking for something other than milk, try yogurt. Yogurt offers a different flavor and texture profile compared to milk. 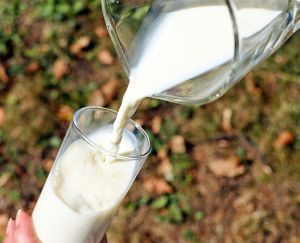 Both carry similar nutrients as yogurt is made from milk. One added benefit of yogurt over milk is the presence of probiotics. Probiotics are live bacteria and yeasts that promote a heathier digestive system. They introduce good bacteria into your gut to help balance out the bad. This helps give us regular bowl movement as well as prevent or improve oral, urinary and skin health. Probiotics also helps with conditions like irritable bowel syndrome and diarrhea. Sugar is probably one of the first things people reach for when they make a bowl of oatmeal. It isn’t the healthiest option. But it’s a quick one. And it definitely kicks up the flavor instantly. Instead of white sugar, try brown sugar for a healthier option. Other sweetening options include honey and maple syrup. Often overlooked, seeds are a great addition to almost anything. 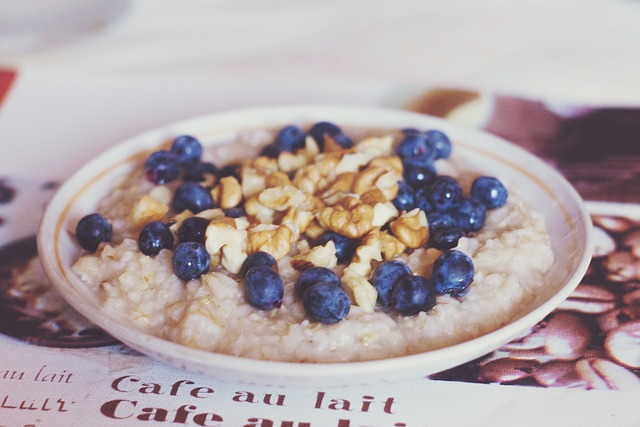 You can add chia or flax seeds to your oatmeal bowl to give you that extra boost of health Omega-3 fatty acid. Seeds are great because they contain a lot of things the regular wester diet lack. These include healthy fats like Omega-3s, magnesium and fiber. Additionally, a small serving is packed with protein and has zero cholesterol. For the minimalist, a couple of simple healthy options include sprinkling cocoa powder or cinnamon over oatmeal. They’re very different in flavor so you can try both to see which one/s you like. Cocoa gives you a bit of the chocolatier flavor, but is much cheaper since you only use a scoop or so each time. Cinnamon on the other hand, has a stronger flavor with a hint of bitterness. Some people love it, a few don’t. With cinnamon, you do get the additional health benefit of blood sugar control. This ingredient has been shown to lower blood sugar levels, making them helpful for diabetics. Do note though, that not all cinnamon are created equal. Some varieties come with a good amount of coumarin, a compound that’s harmful to the liver. Of course, regular nuts will bring up the flavor and crunch. But why not amp it up a notch with roasted nuts. This will give you added flavor plus a bit more crunchiness. You get more texture. Roasted peanuts, almonds, hazelnuts and walnuts all make great add-ons. If you like to do less chewing, you can chop the nuts the smaller bites or even bits. Chocolate lovers probably know this one already. 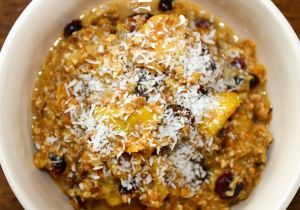 Adding some dark chocolate chips or cacao add extra flavor and decadence to your regular oatmeal breakfast. These brown chunks give a nutty, crunchy and earthly taste that changes everything. You can go with regular chocolate or milk chocolate as well, as they produce delicious results. We do however recommend using dark chocolate or cacao as they’re much healthier and come with a number of benefits. These flavorful crackers aren’t just for snacks, they make a great topping for oatmeal. Break up a few crackers and sprinkle them over your bowl. Alternatively, you can use granola if you prefer. Just a little goes a long way. A pinch of vanilla extract is all you need to transform regular oatmeal to awesome. The great thing with vanilla extract, as well as some other add-ins in our list is you can combine them. Adding vanilla or almond extract right after cooking gives you great added flavor. Plus it gives you the freedom to include different toppings each time. Fresh fruits are among the first things I add into my oatmeal. They’re healthy and loaded with fiber. My favorites are berries. But I’m biased to blueberries and strawberries. Bananas, apples and peaches are other great tasting choices that I’ve tried. The awesome thing about fruits is that they contain a lot of vitamin C and come with tons of essential nutrients. If fresh fruits don’t cut it for you, try dried fruits. Dried fruits are packed with more concentrated flavors due to the drying process. This accentuates the taste of the add-in. If you do choose to go with dried fruits, make sure to use them in moderation. Or, limit the amount you use per serving. Their higher sugar content makes them less healthy than fresh fruit. Try adding one tablespoon of peanut butter into your oatmeal. You’ll see a considerable change in consistency, flavor and crunch to it. Go with your favorite peanut butter brand. You can also try both smooth and crunchy to see which one you like better. Peanut butter comes with some healthy fats, calories if you need them, fiber and protein. It does also have some unwanted fats so moderation is needed. This can be sometimes difficult due to its deliciousness. For the best peanut butter, go with organic unsweetened peanut butter. This way you don’t have the extra sugar and additives that many store bought varieties include in their ingredients. Another sweetener that people often use is juice. Apple juice is a popular choice. I’ve seen a few use pineapple juice as well. With juices, you’ll want to be careful and go for the 100% fruit juices. Many store bought juices contain a lot of sugar which makes adding juice to your daily bowl of oatmeal unhealthy. Should you prefer savory to sweet, then bacon is a great choice. Bacon makes everything taste better. This includes oatmeal. Of course, you’ll want to sprinkle bacon moderately as it isn’t the healthiest food in the world. Whether you like to add small pieces or larger ones, the extra crisp and savory, smoky flavor of morning bacon will bring your oatmeal up to the next level. That’s our list. I’m sure you have your own favorite add-ins and toppings. Tell us what you like to put in your oatmeal to spice it up. Food & Nutrition, General Health, Recipes, Weight Loss. permalink.